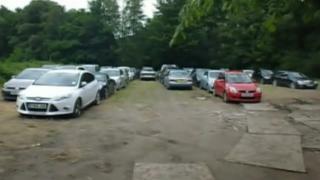 A customer who parked his car with a meet-and-greet firm at Gatwick Airport has told a court how he saw it in a muddy field on social media. Keegan Bowes, 21, said he believed Easy Meet and Greet Ltd would keep his Mini in a secure compound in 2016. He said when he saw an ITV report on Facebook about a meet-and-greet firm parking cars in a field and recognised a car as his own, he felt "disbelief". Asad Malik, 38, of Jura Close, Crawley, denies fraudulent trading. Mr Malik, who ran Easy Meet and Greet Ltd, denies fraudulent trading and engaging in misleading and unfair commercial practice. London Parking Gatwick Ltd, of which he was also a director, denies the same charges in a case being heard at Lewes Crown Court. Mr Bowes said he viewed the Easy Meet and Greet Ltd website and "was under the impression it would be in a secured, locked car park". Jurors heard he paid £105.99 for 16 days' parking. Richard Heller, prosecuting, asked: "Is this the type of car park you had expected from reading the website?" "Not at all", Mr Bowes replied. Mr Bowes told jurors he tried ringing the company while in Majorca, but "they advised me it was not my car". He said his mother Linda Glover spoke to the firm and arranged for the car to be returned early, but found that a door would not open and the satnav was missing. The court heard she complained to the police and the parking firm. Kier Monteith, defending Mr Malik, asked Mr Bowes if he chose the company for the price, adding: "I suggest Easy Meet and Greet was close to the lowest price if not the lowest." "It was not the lowest," Mr Bowes replied. Mr Monteith asked Mr Bowes if the website just said "compound", but Mr Bowes replied: "I think it said '24-hour manned compound'." Reading from the website, Mr Monteith said: "We take your vehicle directly to our compound." Mr Bowes said: "To me, 'compound' means a secure place."